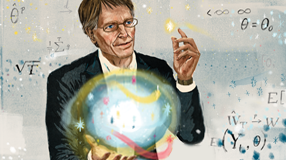 Nobel Prize winner Lars Peter Hansen shapes the legacy of Chicago economics. Paulina Rincon-Delgadillo received the University's first doctoral degree in molecular engineering. Neubauer Collegium founding director David Nirenberg will serve as dean of the Social Sciences Division effective July 1. A psychologist explores humans' remarkable ability--and frequent failure--to understand each other. Researchers, including Chicago Booth's Anuj Shah, cited for work on the decision making of the poor, who live "under a deadline that never lifts." Sociologist Linda Waite finds that cohabitating couples are three times more likely to report violent arguments than those who are married. Social neuroscientist John Cacioppo says the quality, not the quantity, of human connections determines whether a person feels lonely. 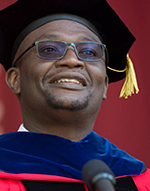 Linguist Salikoko Mufwene, PhD'79, finds that the Kiyansi language he grew up speaking in his native Congo "exists more in my imagination than in practice." Former Treasury secretary Lawrence Summers calls House of Debt, by Chicago Booth's Amir Sufi, "the most important economics book of 2014." In the 519th Convocation Address, Chicago Harris economist Kerwin Charles reminded members of the Class of 2014 of their common bond. Playing UChicago's latest alternate reality game.